I’m not a fan of needles but I don’t have a strong fear of them either. I understand that the pain associated with the sharp poke will be short-lived. My boys on the other hand don’t quite believe me, I guess it’s hard to look past a scary sharp needle knowing it will hurt. Last year we had the boys tested for a gene that predicts type 1 diabetes (Peter is a type 1 diabetic). It required a blood draw and while Quinn was a champ during a previous experience, this time around he really struggled with it. It was awful trying to calm him down and convince him it would be ok. We both survived the stress but his extreme fear of the needle was heart breaking. As a mom, I want to minimize any unnecessary pain but still make sure they get all the necessary medical care to keep them as healthy as possible. Unfortunately bad needle experiences can lead to needle phobia. I have family members who avoid needles at all costs because of their needle phobia which can adversely affect their health. So I was pretty excited to learn about this awesome new product on the market that can help make shots and blood draws less painful! Buzzy was created by pediatrician Amy Baxter to help tackle the challenge of needle phobia and needle pain. How does Buzzy work? Using distraction, vibration and cold. It works on both adults and kids although clearly designed with children in mind. I love that it’s a drug free solution! Personally, I think it’d be great to have the Buzzy available in all pediatrician’s offices. I’d love to take my boys for an appointment and not have them worried about a possible shot because they no longer fear the needle. 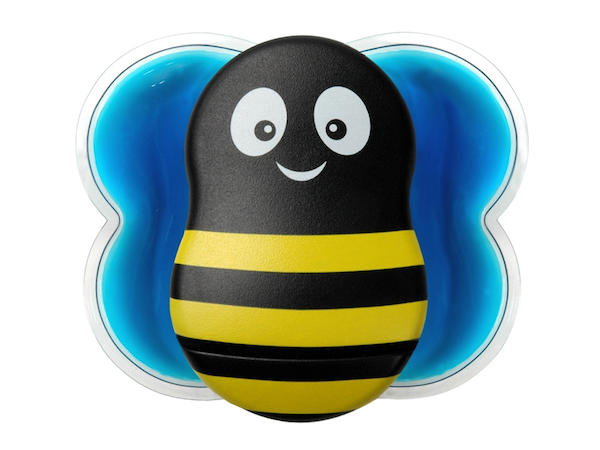 Learn more about Buzzy on ABC’s Shark Tank on February 28th (9PM CST). Plus during the episode you can participate in a twitter party (#SharkBuzz) with a chance to win a Kindle or Buzzy products. Do you know anyone that could use a Buzzy? I love the Buzzy idea – I’m hoping my kids never develop a fear of needles but you’re right they are exposed to them a lot more than older generations. I totally missed Shark Thank tonight, there was also a twitter party happening at the same time but I was too wrapped up with my boys. I definitely think it’s a NECESSARY product anywhere children are regular poked with needles. Hopefully they can make that happen!